Impatiens add color to shaded garden beds. Available in colors ranging from pink to deep lavender, impatiens produce abundant blooms amongst bright green foliage. These annual flowers thrive in the cooler weather of spring, but can bloom all summer long with proper care. 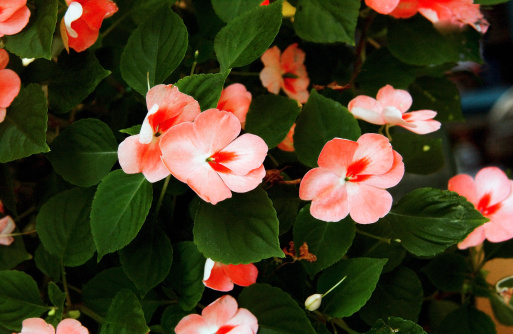 If impatiens aren't blooming well, they likely aren't receiving the nutrients, water or maintenance they need. Healthy impatiens flower for months. For the best blooms, choose a garden bed that receives dappled sunlight all day or morning shade and afternoon sun. Impatiens can't tolerate the direct mid-day sun. Plant in beds that also provide good drainage. The flowers thrive in rich loam soils that aren't prone to standing water. Apply compost to the bed before planting to improve the quality of the soil and improve the blooms on the plants. Impatiens are heavy feeders, so additional fertilization is needed throughout the growing season to replenish the plants for reblooming. Impatiens require nitrogen to produce healthy foliage and phosphorus to bloom. A fertilizer that provides equal amounts of these nutrients, such as a 10-10-10 or 13-13-13 analysis, works well in most gardens. Reapply the fertilizer every six to eight weeks throughout spring and summer so the impatiens are never starved for nutrients. Proper irrigation ensures the soil never dries out completely. 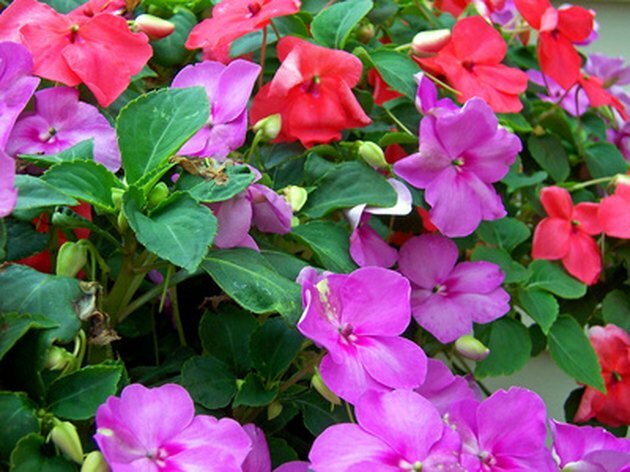 Impatiens can't tolerate drought, so watering regularly is necessary, otherwise the plants suffer and blooms diminish. Provide enough water to moisten the top 6 inches of soil at each watering, which is about equal to 1 inch of rainfall. Water one to two times a week, or when the soil surface just begins to dry. Mulching around the plants helps keep the soil moist between watering. Water at the base of plants so the flowers and foliage remain dry. Wet plants are susceptible to powdery mildew. Come midsummer, a combination of heat and older plants can lead to impatiens becoming leggy. They may also begin blooming poorly at this time. Improve both the shape of the impatiens and the amount of flowers by pinching back the plants. Pinch back all the stems to within 3 inches of the ground, leaving at least one set of leaves on each stem. Impatiens quickly produce new growth and return to full bloom within a couple of weeks after pinching. The foliage also returns fuller and rounder, giving a better shape to the plants.